On Sunday, October 1, during the All Night Vigil, when the church was overflowing with those at prayer, the Fool-for-Christ St Andrew, lifted up his eyes towards the heavens and beheld our most Holy Lady Theotokos coming through the air, resplendent with heavenly light and surrounded by an assembly of angels. The icon of the Holy Protection shows the Theotokos standing above the faithful with her arms stretched open in prayer and draped with a veil. Angels are on both sides of her. St Andrew and his disciple Epiphanius are in the lower left. 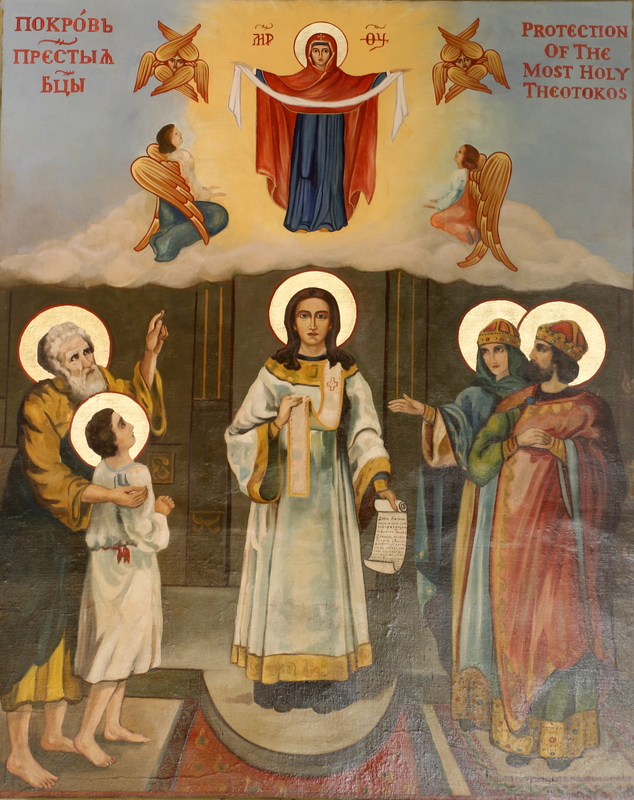 In the center of the icon, is a young man with a halo dressed in a deacon’s sticharion. In his left hand he is holding an open scroll with the text of the Kontakion for the Nativity in honor of the Mother of God. This is St. Romanus the Melodist, the famous hymnographer whose feast is also celebrated on October 1. On the right are the Emperor Leo the Wise and the Empress of Constantinople, defenders of the Orthodox faith.